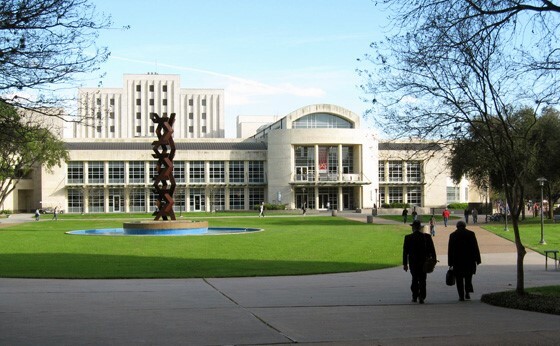 The M. D. Anderson Memorial Library lies at the crossroads of the sprawling University of Houston (UH) campus. Situated between the Cullen Family Plaza and the Student Center, thousands of Houstonians pass by the massive limestone building every day. Those who enter the library’s glass doors are greeted by a three-story atrium bustling with activity: students rush up and down the Grand Staircase, chatter around group study tables, and scramble behind oversized computer screens to complete assignments. Beyond the atrium, students pile into elevators for a short ride to the much quieter Brown or Blue Wings. The library is the heart of the university, serving as a retreat for students in between classes and a resource for the experienced and aspiring scholars. The 250,000-square-foot behemoth—representing just one part of the UH Library System—began quite modestly, however, as merely a few shelves of books over ninety years ago. When Houston Junior College was founded in 1927, administrators at San Jacinto High School (SJHS), where the college classes met, granted the fledgling school a section of the high school library to call its own. For the next few years, the college’s book collection grew slowly, as President E. E. Oberholtzer focused primarily on securing space for the college’s classes rather than the library. This changed in 1933, when Ruth S. Wikoff became head of the junior college’s library. Even in the depths of the Great Depression, Wikoff wasted little time in adding to the collection and building a library that met her standards. In 1934, Houston Junior College officially transitioned to a four-year university and became the University of Houston. By this time, 900 students were enrolled in classes at UH, which met in various buildings throughout the day and at SJHS at night. 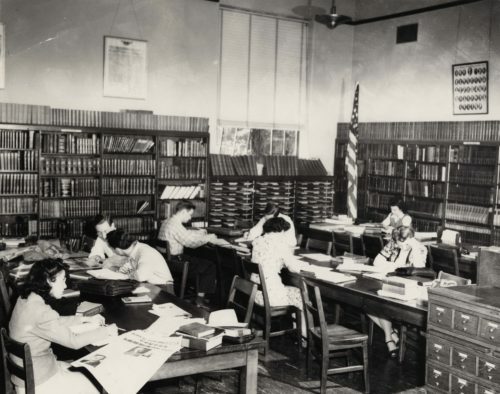 By 1935, Wikoff’s efforts had overwhelmed the high school’s library, which overflowed with study tables and books. Something had to be done. In response, President Oberholtzer, who was also superintendent of the Houston Independent School District, conveniently arranged to build a new music room for the high school, thereby freeing up the old music room for the university’s library. First library in the Roy G. Cullen Building on the new UH permanent campus. Photo courtesy of M. D. Anderson Library, University of Houston. By 1936, President Oberholtzer and other administrators realized that the university needed its own space of its own. The original plans called for a new campus in Memorial Park, but the deal fell through after controversy erupted over oil drilling stipulations in the contract. The controversy’s press coverage proved helpful, however, when shortly thereafter the Settegast Family and Captain Ben Taub agreed to donate over 100 acres of land for the university’s campus. Following an aggressive fundraising campaign, which included the first of many donations by Lillie and Hugh Roy Cullen, the university drained the swampy land and began construction on its first two buildings. On Monday, June 5, 1939, classes met in the new Roy G. Cullen Memorial Building; soon after, the Science Building was completed nearby. After twelve years, the University of Houston had its own home. Lisa German, the current dean of the M.D. Anderson Library, talks about what the library means to the campus and its importance to the student body and the faculty.